In 2010, when Scott and Bonnie Dunbar purchased the Sarasota house they planned to live in after Scott retired, they knew that they would have an arduous remodeling task ahead of them. 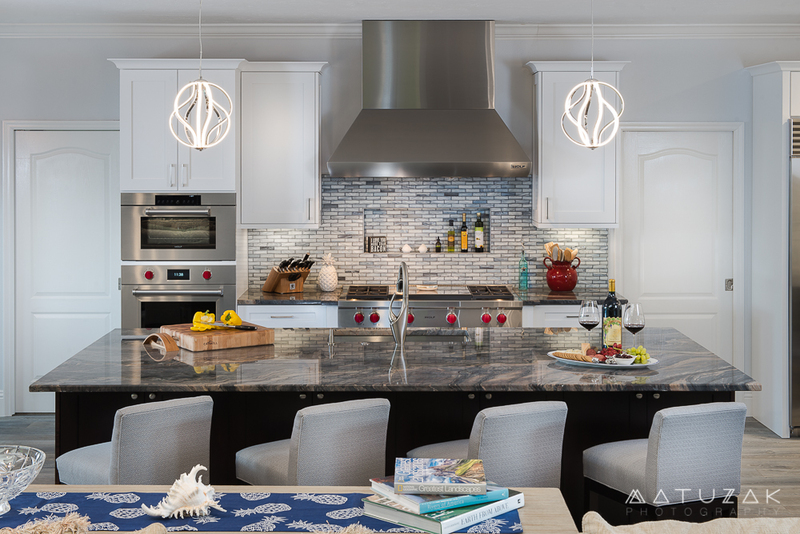 Six years later when they made the move, they were faced with selecting new cabinets, flooring, lighting, backsplash and appliances, and also deciding on any architectural changes that would create a kitchen space they would love. They decided to look for professional help to pull it all together. Bonnie had an idea of what she needed in order to bring her kitchen up to date, but she wanted the guidance of a kitchen designer to make certain that she did not make any costly mistakes. After speaking with several designers, she called Kitchen Design by Laura, and quickly became enamored with Laura’s vision, enthusiasm and “creative eye.” Bonnie also appreciated that when Laura came out to look at her kitchen, she came equipped with hundreds of samples of all the elements that are needed to redesign and remodel her kitchen: cabinets, flooring, backsplashes and hardware, all neatly displayed inside her mobile showroom! When Bonnie wanted to see an even broader selection, Laura took her to several showrooms with which she is affiliated, so that she could find her ideal finishes. “We were happy with all the places we visited. All the people were very nice, knowledgeable and enthusiastic about their products. Laura worked closely with her contractor and team to take care of all that was needed, costs and everything. With Laura’s expert advice, we didn’t have to do anything other than choose what we wanted,” she said happily. She is especially delighted with the stunning Blue Fusion quartzite she selected for her countertops. The rare Brazilian stone has phenomenal color and movement. “It’s artwork, spectacular!” she exclaimed. Scott and Bonnie feel the same way about the excellent quality of their cabinets and are loving the lighting fixtures they selected. “Everyone who comes into the house sees the LED ribbon light above the dining table and remarks about how extremely cool it is.” Bonnie and Scott did not have to get involved with hiring installers, carpenters, electricians or plumbers. Kitchen Design by Laura took care of all the details while their dream kitchen was being created. They were impressed by her contractor and entire crew. They found the workers to be very neat and thoughtful in their duties; they made certain that there was easy access to different rooms of the home during construction, and that things were cleaned up every evening before they left. Bonnie loved that the workmen were all very pleasant and skillful, and that there was no complaining, no drama, and best of all, everything was completed in a very timely manner. Both Bonnie and Scott love to exercise their culinary prowess, and having their beautiful, spacious open-plan kitchen has them excited to create new dishes for their family and friends. To those family and friends, Bonnie shares her delight with the process of her kitchen remodel, “The entire experience of working with Kitchen Design by Laura has been very easy and smooth. It’s been a pleasure. We would absolutely work with them again.” With hundreds of completed kitchen and bathroom remodels, Laura and her team supplies the most extensive reference list at her initial consultation. She also has other sources of reviews that you can check as well, including Houzz, Angie’s list and the Better Business Bureau. Get your dream remodel started today. Call Kitchen Design by Laura at (941) 780-2731 for your in-home consultation and visit laurawallace.com to see amazing before and after photography.